Sunday night is the Oscars and admittedly I am probably more excited for the red carpet dresses than the actual awards show. I love to see what the dress trends are and which designers each celebrity choose. It's always interesting to see if they'll go with edgy or classic- an independent or legendary designer. I've partnered with Little Black Dress Vodka & lifestyle expert Maureen Petrosky to come up with the perfect red carpet cocktail that would be great for a night watching the awards show or getting ready to go out with the girls! In a large pitcher filled with ice, combine all of the ingredients and stir. 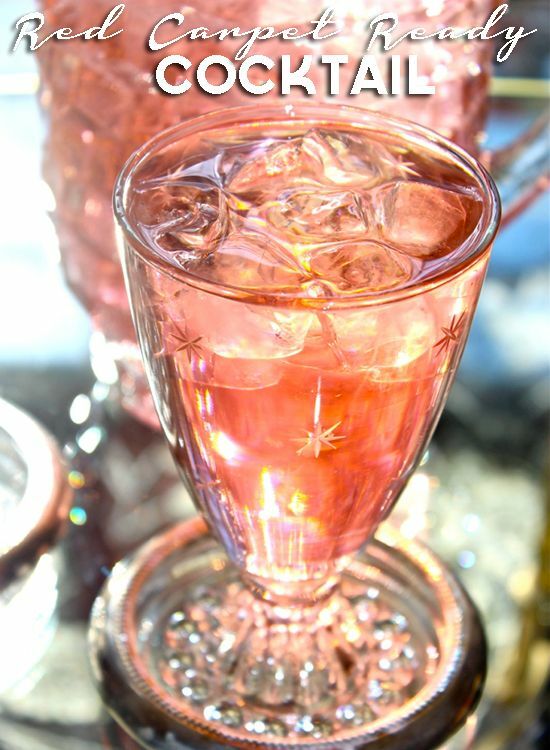 Serve in Champagne flutes. Ask guests to deliver acceptance speeches as you bestow them each with their well- deserved glass. I've also created a handy printable Oscar Dress rating card where you & your friends can rate the dresses on the red carpet and pick who wore it best! click here for the printable Oscar Dress Rating Card! 1. Keep it small. Too many guests- more than 10- means you’ll likely miss the whole show. 2. Offer easily portable snacks so guests can graze and still see the TV. Which, by the way, if you have more than one, turn them on so the red carpet can be viewed from as many places as possible. This is one of the only times I will recommend all TVs on for a party. 3. Serve big batch drinks. Pre-made batched drinks let you be part of the fun instead of working the event. 4. Keep it casual but not too casual. The red carpet starts at 3pm EST, which means that west coast viewing parties kick off even before noon. No need for floor length gowns and up-dos but don’t skip the glitz all together! This is the red carpet after all. Throw on sparkly stilettos with your jeans. Don some fabulous jewelry with a simple sweater and of course, break out your best crystal to toast the best dressed! Will you be getting together with friends to watch the Oscars on Sunday? P.S. Check out Life's a Journal for a printable Oscar ballot & the Swell Caroline blog for great entertaining ideas! What a great idea to user a rating card! So cute :) Hope you're enjoying it! Hi ! What a great resource! This article is really very nice to know some of new Cocktail dress in 2013…Thanks! Pretty Cocktail. Thanks for sharing such a nice post with us here. It really attracted me a lot and I bookmarked your blog for future reference. Nice post. Giving rating is some what important to popular.